The School of Fine Arts is founded on the belief that our God is the great Artist. We worship God when we create art from the patterns He created. Whether these artistic expressions are literary, dramatic, musical, visual, or even in the field of New Media, we understand that we were made to create in imitation of our creator. The School of Fine Arts believes that Art is integral to the living of a full life. Towards that end, we offer courses and degrees in visual arts, music, creative writing, cinema, and mass media. HBU offers a Bachelor of Fine Arts degree (BFA) and a Bachelor of Art (BA) degree in Studio art. Both BFA and BA degrees prepare an individual for studio art though the BFA is a more intensive program, which thoroughly prepares one for the possibility of further graduate studies. The BA requires less studio hours, which is best for students who would like to double major. The Visual art program is designed to help the student develop a personal, critical attitude toward his/her life situation through creative involvement. The beginner is offered a variety of courses that provide technical training, historical background and professional competence while maintaining the dignity of individual opinion and direction. These studies are designed to generate interest and promote the understanding of art, which comes in part through analysis of creative works of past and present. A Senior Seminar provides an opportunity for the student’s area of specialization to be the central theme in a final project. The Department of Visual Arts offers instruction in five basic studio areas:  Drawing, Painting, Ceramics, Sculpture, and Printmaking. The members of the art faculty bring a wealth of professional experience to their studios and their students. 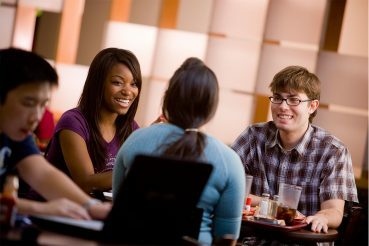 Students in the studio areas have the unique opportunity of receiving feedback in both individual and group critique sessions. The goal of the art faculty is to nurture and encourage students of all levels of experience in finding their visual voices and developing their own visual language. The Visual Arts program also offers an All Level Art with Teacher Certification degree in conjunction with the College of Education and Behavioral Sciences, as well as a Pre-Professional Art Therapy degree offered in conjunction with the Department of Psychology. The student arranges for official AP scores to be sent from their high school to the HBU Office of the Registrar. The student presents the AP portfolio compiled through the high school art program to the HBU Art faculty for evaluation. The student receives written approval from the chair of the Department of Visual Arts to accept the scores and portfolio in lieu of a lower level art course(s). Each evaluation will be made on a case-by-case basis. No more than six (6) semester hours may be awarded for AP credit. Art majors are required to participate in annual student exhibitions and other exhibits, programs, and lectures. The University reserves the right to permanently retain one (1) work from each student in each class. The art faculty will decide the disposition of these works. Other works may be held temporarily for use in specific exhibitions. These will be available to owners no later than two (2) years after the lending date. Art majors must participate in at least one (1) approved exhibition during both junior and senior years. These opportunities must be approved by the department chair and mentored by a member of the Art faculty. Art majors are also expected to participate in the organization and presentation of the annual Student Art Exhibition (Spring Semester). Every art major is required to hold a Thesis exhibition, which professionally displays art works produced by the student during his/her undergraduate studies. The exit exam in Art is presented in the form of a formal portfolio review juried by a committee of Art faculty. The review is offered in the final week of Fall and Spring Semesters, and should be scheduled by the student in the semester of graduation. The Bachelor of Arts in Studio Art degree allows the student to pursue a major or minor in art and another unrelated discipline. The Bachelor of Fine Arts in Studio Art is considered a professional degree according to the National Association of Schools of Art and Design (NASAD). The BFA, Bachelor of Fine Arts, is an excellent choice of degrees for those wishing to attend graduate school for a Master of Fine Arts degree. This certificate allows those interested in art history to expand their knowledge in this area. There are a variety of target audiences including continuing education students, prospective art majors, history enthusiasts, and lovers of art wishing to expand their understanding and appreciation for the discipline. 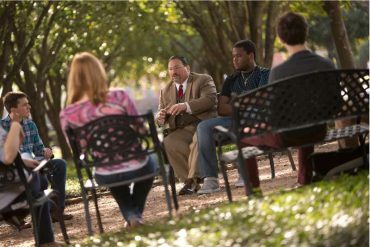 The online offering extends the possibility to acquire this knowledge to a larger audience not confined to HBU’s residential campus. Please refer to the current Department of Visual Arts Handbook for further details. The Cinema & New Media Arts (CNMA) program provides a challenging creative environment for students to develop their artistic abilities and prepare for future work in multimedia production. Taking advantage of developing technology, the curriculum is uniquely focused on new opportunities available to filmmakers, media artists, and storytellers in the twenty-first century. The program offers students ample opportunities for practical, hands-on experience coupled with mentorship from experienced faculty members. All of this is designed to prepare students for a variety of pursuits, including filmmaking, digital design, journalism, video games, and emerging opportunities in new media and technology. Three degrees are available to CNMA students: a streamlined 40 credit hour BA in Mass Media Arts, a comprehensive 57 credit hour BFA in Cinematic Arts, and a 58 credit hour BFA in Interactive Media & Digital Design. The BA in Mass Media Arts begins with five foundational classes in visual media, storytelling, communication theory, and business skills before offering students a variety of media-related electives. Students can select film/video production classes, creative writing and journalism courses, and special topics like public relations or video game design. Mass Media Arts students also take part in multiple professional internships with Houston-based media companies and organizations. Each graduate of the Mass Media Arts degree completes a professional portfolio showcasing his or her best work within the program. The BFA in Cinematic Arts expands this curriculum by providing students a comprehensive education in filmmaking and video production. In addition to the foundational CNMA classes, our Cinematic Arts students take multiple classes within specific areas of specialization, such as screenwriting, directing, editing, or cinematography. The degree also offers numerous classes in film history and theory designed to provide students important foundations for their artistic work. The final year of the Cinematic Arts degree is focused on faculty-directed practicums and a two-semester Senior Project designed to showcase the student’s best cinematic skills. A minor in Cinema & New Media Arts is also available. All students interested in majoring in a Cinema & New Media Arts degree must first complete 15 hours of the CNMA Program Core to determine readiness in key proficiencies such as technical experience or creative aptitude. The CNMA faculty will evaluate each student based on a Proficiency Rubric (outlined in the Cinema & New Media Arts Handbook) to determine whether the student is ready to enter one of the CNMA majors, or the student may continue under a provisional status until certain proficiencies are met. As the required “gateway” to enter the CNMA program, failure to pass the CNMA Placement Process will require the student to consider an alternative major degree program with only the option of a minor in Cinema & New Media Arts. Please refer to the current Cinema & New Media Arts Handbook for further details. The Writing program prepares students to explore the creative potential of the written word. Like J. R. R. Tolkien and C. S. Lewis, this program approaches the act of writing as an act of sub-creation in which the writer worships God the artist in the writing of original work. Students take intensive writing workshops in poetry, fiction, nonfiction, and playwriting with well published writers in these fields. Furthermore, through this program students connect with the rich opportunities the writing community of Houston offers such as publication experiences, professional writing internships, writing conferences, and readings from world famous writers. A Major and a Minor are offered. Houston Baptist University’s Department of Music is committed to offering a world class music education where student artists expand their creative gifts, and ultimately contribute their talents to the Western classical music heritage. Designed to provide a broad aesthetic experience for both the music major and the general student, the program introduces undergraduates to the fine arts along with the theories that underlie them, and offers opportunities for creative involvement and enrichment in various ensembles. With the campus’ location so near Houston’s cultural center, students also regularly enjoy outstanding artists, lecturers, theater, and other renowned musical performances. The music curricula provide the specialization and depth of study necessary for performance (voice, piano, and organ), or teacher certification (voice, keyboard, woodwind, brass, or percussion). Qualified non-majors may participate in one of the performing ensembles. Students who wish to major in music must apply for acceptance to a degree program that leads to a Bachelor of Arts (BA) in Music, a Bachelor of Music (BM) (performance—voice, piano, organ, or keyboard performance), or a Bachelor of Music Education (BME) (teacher certification – vocal/keyboard or instrumental). Incoming freshman, transfer students, and other currently enrolled students who wish to major or minor in music must audition (demonstrate their talent for performance) for the faculty in their major applied area before being admitted to the Department. Three or four auditions are held each year between January and August. A prospective student may register for an audition at HBU.edu/MusicAudition. Incoming students who wish to major or minor in music and have limited music theory experience must familiarize themselves with the rudiments of music theory at MusicTheory.net. Please refer to the current Department of Music Handbook for further details. Individual instruction is offered in voice, piano, organ, all band instruments, and composition. All students enrolled in applied music for credit will be required to take a jury examination at the end of each semester. Please refer to the current Department of Music Handbook for more specific information. Music majors must be registered for applied music in their area of concentration until they pass the Sophomore Review (MUSI 0003) and meet any recital requirements (MUSI 3090 Performance Recital and / or MUSI 4090 Senior Recital). All lower level applied music courses (lessons) will carry an MUSI 11XX or 12XX number and all upper level applied music courses (lessons) will carry an MUSI 31XX or 32XX number. Please refer to the current Department of Music Handbook for further details. 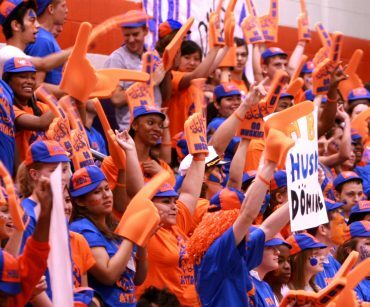 The Husky Band is a prominent and visible representative of the University, with engagements at home football and basketball games, and collaborates with various student organizations on campus. As an academic initiative and group, the Husky Band and its auxiliary group, the Color Guard, are not student organizations, but reside within the Department of Music. The Color Guard adds color and visual display through the choreography of flags, rifles, and sabers at HBU’s football games. All band members, including Color Guard members, must register for MUSI 1111 (Husky Band) to participate in the ensemble. Any approved student who meets the audition requirements may participate in an ensemble. Music majors must participate in Schola Cantorum (MUSI 2111), University Singers (MUSI 1113), Opera Workshop Ensemble (MUSI 1119), Chamber Music Ensemble (MUSI 2112), or Band (MUSI 1111) each semester in residence. Keyboard majors are required to participate in one ensemble and may be assigned accompanying duties. Choral Activities: Music majors with an emphasis in voice must participate in Schola Cantorum (MUSI 2111) or University Singers (MUSI 1113) or with permission, select another ensemble each semester. Students may register for Opera Workshop Ensemble (MUSI 1119) as available or required by degree plan. Instrumental Activities: Music majors with an emphasis in instrumental music must participate in the Chamber Music Ensemble (MUSI 2112), Band (MUSI 1111) or, with permission, select another ensemble each semester. All music scholarship students must fulfill the following criteria to maintain eligibility for the financial award: 1) enrollment as a full-time student pursuing a Bachelor of Music, Bachelor of Music Education, or Bachelor of Arts degree, 2) maintain an overall GPA of 3.0 for all courses taken at HBU, 3) enrollment each semester in an ensemble (except Clinical Teaching semester), 4) enrollment in at least 12 credit hours per semester, and 5) earn a grade of B or higher in applied lessons. Music majors who switch from the major in music to the minor or another degree will no longer be eligible for music scholarships. Please refer to the current Department of Music Handbook for further details. All music majors must be enrolled in keyboard studies until the minimum requirements for keyboard proficiency (MUSI 0002)  as set forth in the current Department of Music Handbook have been met and the examination has been passed. In certain instances, students who have passed a keyboard proficiency examination may be permitted to waive further keyboard studies. This examination shall be administered regularly at the end of each semester and at other times as required. The keyboard proficiency examination must be completed before student teaching, internship, or presentation of senior recital. Please refer to the current Department of Music Handbook for further details. The purpose of the Sophomore Review (MUSI 0003) is to assess the progress made by each music major during his or her first two years of study. Students will enroll in MUSI 0003 at the end of the fourth semester (after earning about 60 semester hours of applicable music credit toward their degree) and be concurrently enrolled in MUSI 2323 Theory IV and MUSI 2023 Theory IV Lab. Transfer students with 60 hours or more of transfer credit must take the Sophomore Review Examination at the end of their first semester after being admitted to the Department of Music. It consists of four parts: 1) A well-written essay regarding their choice of major and career path; 2) A student performance in a Department of Music Forum; 3) An interview with Sophomore Review Committee; 4) performance of a self-prepared selection on their jury. Each student will have a maximum of two attempts to pass all sections of Sophomore Review (pass / fail grade). As the required “gateway” course to all upper level (MUSI 3000 and 4000) courses, failure to pass all four parts of MUSI 0003 after two attempts will require the student to consider an alternative major degree program with the only option of a minor in music. Please refer to the current Department of Music Handbook for further details. Every student enrolled in a private applied music course will be required to take a jury examination at the end of each semester of study. The jury will consist of the members of the faculty in the student’s major field of performance. Please refer to the current Department of Music Handbook for further details. All music majors enrolled as full-time students (12 or more credit hours) must register for and pass seven semesters of MUSI 0001, Forum Recital Attendance. Please refer to the current Department of Music Handbook for further details. The Bachelor of Arts (BA) in Music students and the Bachelor in Music Education (BME) students are required to perform one recital of 30 minutes duration (MUSI 3090). All other Bachelor of Music students are required to perform both performance (MUSI 3090) and senior (MUSI 4090) recitals. Please refer to the current Department of Music Handbook for further details. 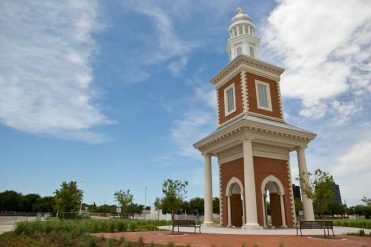 The HBU Master of Fine Arts (MFA) is a Christian-based, two-year studio program with specialization in the areas of two-dimensional studies (painting, drawing, printmaking) and three-dimensional studies (sculpture, ceramics). MFA candidates accepted into the program are offered a studio space, teaching assistant experience as well as scholarships for study. The Department of Visual Art, School of Fine Arts is housed in the University Academic Center, a 44,000 square foot state of the art facility, which possesses fully equipped labs in printmaking, painting, drawing, ceramics, and sculpture as well as working studios for its full time art faculty. This fusion of artist faculty members making art on campus fosters a closer creative community and an opportunity for graduates to fully engage with their faculty team. The Senior Director of Art Programs and Artist-in-Residence, Mr. Michael Collins, is a well-recognized artist and teacher who has shepherded the development of the Master of Fine Arts program since its inception in 2011. Exhibiting on the national and international level, Mr. Collins provides MFA graduate students, creative inspiration as well as practical experience in building a professional career. Artist/Curator-in-Residence, Jim Edwards, directs rotating exhibits by senior regional artists in our 1,100 square foot Contemporary Art Gallery. Mr. Edwards is the former co-curator of the Pop Exhibition at the Menil Collection, Houston and is a well-known expert on Art of the American West and specifically Texas Art. Kathy Bilyeu serves as Director, Graduate Programs, School of Fine Art. A printmaker and photographer, Ms. Bilyeu is also Director of the 1,000 square foot Fine Arts Museum. Both the Contemporary Art Gallery and the Fine Arts Museum allow MFA candidates to examine aspects of art history as well and contemporary art production in these dedicated spaces within the University Academic Center. Additional art faculty include Esther Delaquis-Baidoo, printmaking and painting, Hans Molzberger, ceramics and sculpture and Joel Stanulonis, drawing and painting. A number of excellent art adjuncts further enrich the program both with their teaching, studio visits and exhibition schedules. Outside art professionals in many technical areas are invited to campus to conduct MFA Workshops on a rotating basis.